Our Personalised Ornate Swirl Cheeseboard comes with 3 cheese knives and is a practical and stylish addition to any kitchen. The wording 'Cheese Board' are fixed text and part of the design. 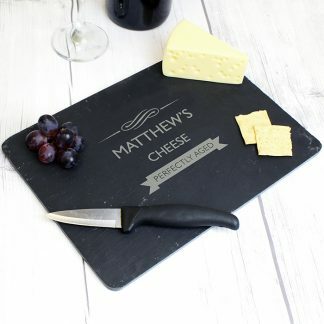 You can personalise the cheeseboard with a message. 3 Cheese Knives, High Carbon Stainless Steel Blades with Riveted Bakelite Handles. Made of a natural Hevea wood, colour and grain may vary from picture. New Home, Wedding Gifts, Anniversary, Birthday, Christmas, Valentines Gift.